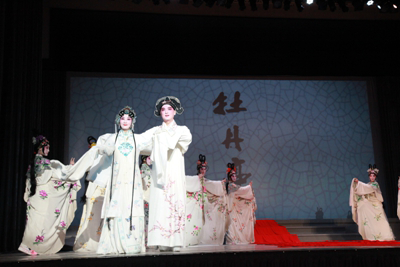 On the evening of 28 September, the 2016 Young Lover's edition of The Peony Pavilion presented by Suzhou Kunqu Opera Theatre of Jiangsu Province was staged at Troxy London. The three-day performance would make its mark in this year's series of cultural exchanges under the theme of Dialogue between Tang Xianzu and William Shakespeare. Chinese Ambassador to the UK H.E. Liu Xiaoming and Madam Hu Pinghua, together with an audience of more than 1000 from various countries, watched the performance. This year is the first year of the "Golden Era" of China-UK relations, and a special year in which the UNESCO advocates the commemoration of the 400th anniversary of the passing of three international literary masters: Tang Xianzu, Shakespeare and Cervantes. During his state visit to the UK last year, President Xi Jinping called on both countries to jointly celebrate Tang Xianzu and Shakespeare. The proposal received warm responses from both sides. Since the beginning of this year, the cultural institutions and academic circles of both countries have hosted a variety of cultural exchanges and commemorations. As one of the key commemorations held in the UK, this week-long trip to the UK commemorating Tang Xianzu is organised by Jiangsu Provincial Department of Culture and is undertaken by Suzhou Kunqu Opera Theatre of Jiangsu Province. Through performances, lectures, dialogues, exhibitions and exchanges, the event tells the British audience about Tang Xianzu, his Peony Pavilion and China's traditional drama. The performance on the 28 September – The Peony Pavilion – is a magnum opus of Tang Xianzu. 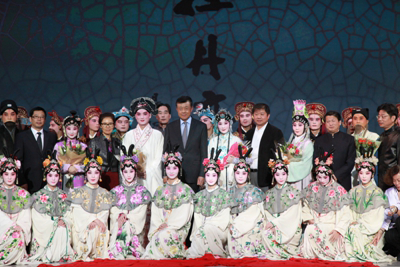 Adapted by the renowned Chinese writer Kenneth H. Y. Pai, the play is performed by 68 artists from Suzhou Kunqu Opera Theatre in three parts across three evenings. The strong cast, the brilliant singing, the exquisite production, the original manifestation and the beautiful stage setting vividly reproduced the essence of the 400-year-old play of Tang Xianzu. The audience was deeply touched by the oriental features of Kunqu Opera which resonated strongly among the British viewers. When the performance was over, the audience stood up and expressed their gratitude with enduring applause to the artists. 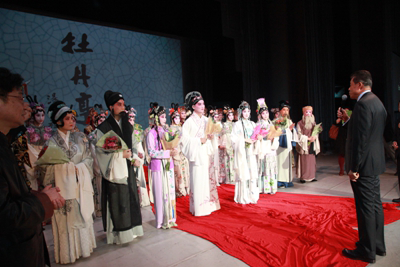 Ambassador Liu visited the cast after the performance and offered his congratulations. He said, last October, President Xi Jinping paid a successful "super state visit" to the UK. Not long ago, British Prime Minister Theresa May attended the G20 Hangzhou Summit in China and had a successful bilateral meeting with President Xi Jinping. Both leaders reaffirmed that China-UK relations are entering the "Golden Era", and that both sides are committed to bringing the global comprehensive strategic partnership to a higher level. As a concrete result of President Xi's visit to the UK, the performance tour to the UK by Suzhou Kunqu Opera Theatre of Jiangsu Province will add splendour to the cultural exchanges between China and the UK in the "Golden Era".